Juno MacGuff: I think I’m, like, in love with you. Paulie Bleeker: You mean as friends? Juno MacGuff: No, I mean, like for real. You’re like the coolest person I’ve ever met and you don’t even have to try, y’know. Paulie Bleeker: I try really hard, actually. I must be older at heart than I thought. I was instantly put off by Jason Reitman’s JUNO. Here you have this little movie about a pregnant teenager who is just trying to do the right thing by everyone and all I could think was how hard it was trying to have its own marginalized identity. A sketched doodle of the word, “autumn” appears at the top of the screen; the sounds of Barry Louis Polisar’s indie acoustic music begin to play as a comic book-like animated title sequence takes over the screen; Rainn Wilson, working as a convenience store counter clerk, says things like, “Your eggo is preggo,” and “What’s the prognosis, Fertile Myrtle?” It was as though Reitman was pulling out every trick he could think of to make sure we knew how edgy his film was. “We are indie!” it screamed like a loud teenager yammering away in the back of the theatre. Only, just like that teenager, JUNO is much deeper than it first appears and simply requires a closer look to see Reitman’s sensitive, gentle hand at work. JUNO just may be the most earnest and humble film I’ve seen all year. It’s merely hiding behind a tough exterior. That tough exterior comes courtesy of first-time screenwriter, Diablo Cody, and is reinforced by Reitman’s strong understanding of the nuanced material. It is honest, frank and forgiving, which is a refreshing take from the usual damnation pregnant teenage girls suffer on film. Parents don’t scream and shout when they find out about their daughter’s situation; nobody forbids anyone from seeing anybody else ever again. It is not the least bit dramatic considering that exaggeration colors mostly every word uttered on screen. (Look, I can embellish too!) The non-judgmental approach allows almost every character to come from his or her own perspective and place in the story, making them much more real than they let on. We know that prospective adoptive mother, Vanessa (Jennifer Garner), is concerned with image and perception because we see her hands straightening frames and towels while waiting to receive company before we even see her face. 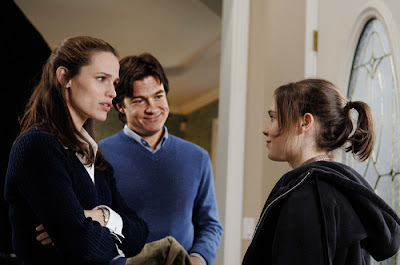 We know that her husband, Mark (Jason Bateman), is not as enthusiastic about the adoption as his wife is because he isn’t by her side when Juno (Ellen Page) first appears at their door. These kinds of subtle visual touches act like prenatal vitamins meant to ensure that Cody’s script is born with a healthy heartbeat. JUNO also gives birth to a new star, albeit a little bit past her due date (despite her young age of 20). Halifax native, Ellen Page, carries the majority of the film and is as complex as they come without making it seem labored (no pun intended). Past starring roles in lesser-known films like HARD CANDY and THE TRACEY FRAGMENTS were explosive and impossible to ignore only the films themselves were overlooked. Turning in another unforgettable performance in a crowd pleaser is sure to get her the accolades and recognition she deserves. Page whips out Cody’s snappy pseudo-hipster speak with fervor and confidence but gives herself away without realizing. She always plays it cool so that no one, including herself, can acknowledge how frightened she must be to be in her position. Her decision to have her baby and put it up for adoption rather than go the abortion route is brave but naïve as she has no idea how adult her decision actually is. She speaks like she has all the answers and yet has no idea what she’s talking about most of the time, but once you catch a glimmer of that fragility, anything that came off as false prior, shows itself as the front that it is. Reitman, Cody, Page and the rest of the fantastic cast (J.K. Simmons, Alison Janney and the fascinatingly talented and gangly, Michael Cera) light JUNO afire with warmth and genuine caring. This is a movie about real people dealing with the obstacles they’re faced with rather than sitting around and whining about them. On that level, there’s nothing indie about this movie. 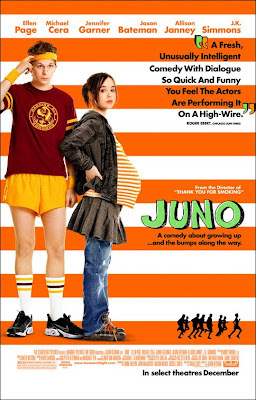 Instead, JUNO is the perfect portrait of a young girl flung into adulthood unexpectedly. She feels prepared, realizes she isn’t, learns that she needs others and yet carries herself like she’s been the one calling the shots all along. It sure sounds awfully adult to me. How many sheep would you give Juno?